P.S. Would it be too much trouble to send me three or four yards of percale in a pretty print, something blue and rose? 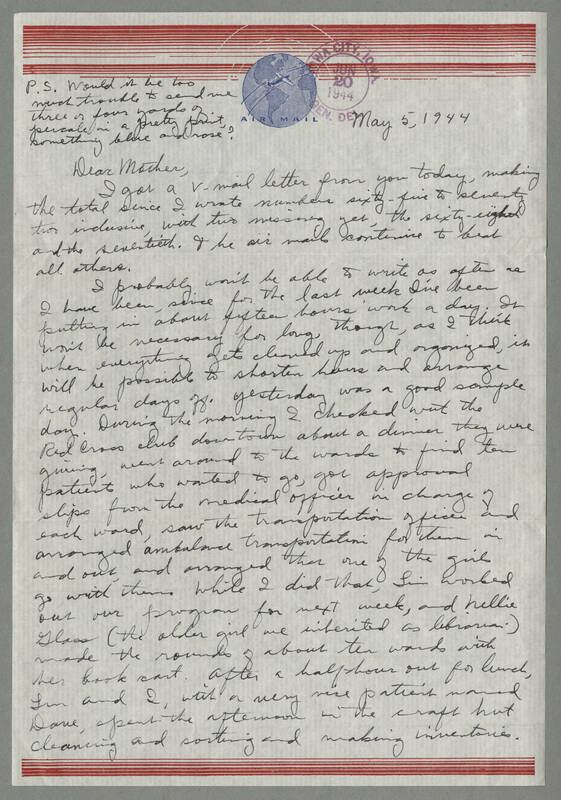 May 5, 1944 Dear Mother, I got a V-mail letter from you today, making the total since I wrote number sixty-five to seventy two inclusive, with two missing yet, the sixty-eighth and the seventieth. The air mails continue to beat all others. I probably won't be able to write as often as I have been, since for the last week I've been putting in about fifteen hours' work a day. It won't be necessary for long, though, as I think when everything gets cleaned up and organized, it will be possible to shorten hours and arrange regular days off. Yesterday was a good sample day. During the morning I checked with the Red Cross club downtown about a dinner they were giving, went around to the wards to find ten patients who wanted to go, got approval slips from the medical officer in charge of each ward, saw the transportation office and arranged ambulance transportation for them in and out, and arranged that one of the girls go with them. While I did that, [Lin?] worked out our program for next week, and Nellie Glass (the older girl we inherited as librarian) made the rounds of about ten wards with her book cart. After a half-hour out for lunch, Lin and I, with a very nice patient named Dane, spent the afternoon in the craft hut cleaning and sorting and making inventories.